I have an older delta model jointer, and I always struggle to get all three knives consistently set at the same height. Anyone have tips or a jig to help keep your planer knives lined up? 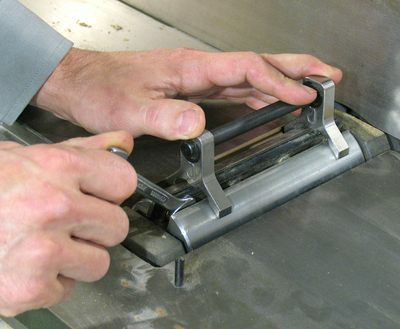 This article has a nice tutorial about how to set the jointer knives. It covers 2 styles of heads. With those you can adjust each screw until the blade is set correctly (as with the straightedge method). 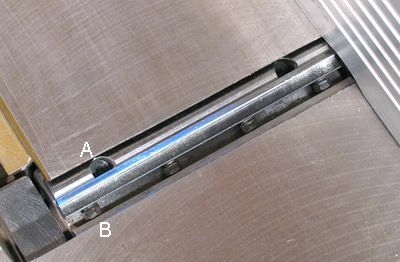 The second style is the one with pushback springs. With those there should also be a jig you hold against the head that holds the knives at the right height and provides enough space for you to tighten the screws. There are a number of tricks for setting these. One I've seen: put a piece of wood across the outfeed table and the head, hand-rotate the head, mark how far the wood was dragged by a single blade, adjust until they all drag it the same distance, repeat for other end of blade, iterate. Or of course you can get a dial indicator. Or build/buy a magnetic jig that holds blade at a known location until you can lock it in. Or ... Haven't tried to compare these so I have no idea about relative accuracy vs hassle vs price. I have an old Delta like that, too. What I do is raise one blade up a few millimeters and loosen the bolts a bit, then place a flat hardwood board over outfeed table and push down. Next I rotate the cutter head backwards so that the blade get pushed down by the board, and apply pressure until it's the right height. I check the result using the straightedge method. It usually takes a few attempts to get all 3 blades aligned. Bolt torque is really important with this method, so try to loosen the bolts very precisely. The difference between "too tight" and "too loose" is really only a few degrees. Not the answer you're looking for? Browse other questions tagged jointer tool-maintenance or ask your own question.